Jeffrey J. Jenkins, age 64 of Fox Lake, peacefully passed away on Monday, August 27, 2018 at Seasons Hospice in Waukesha. Funeral services for Jeff will be held at 11a.m. on Friday, Aug. 31 at the Kratz-Smedema Funeral Home in Fox Lake. Burial will follow in Riverside Memorial Park. A fellowship luncheon will then be served at the American Legion in Fox Lake. Relatives and friends may call on the family from 9 am until the time of services at the funeral home. 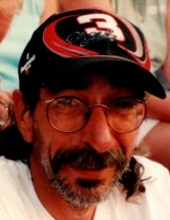 Jeff was born on May 17, 1954 to Robert and Helen (Polenska) Jenkins in Beaver Dam, WI. He graduated from Waupun High School in 1972, when he began work as a welder for Metal Fab in Mayville. In 1979, Jeff began working at John Deere in Horicon where he was a faithful employee until his retirement in June of this year. He was an avid deer hunter, and never missed a NASCAR race on the weekends. He was a lifelong Wisconsin sports fan, especially his Packers and Badgers. He enjoyed tinkering on his 1987 Monte Carlo and throwing back one (or two) whiskey Old Fashioneds. Jeff will be sadly missed and mourned by his family, including his two sons, Aaron (Gina) of Sun Prairie, and Adam (Amanda) of Fond du Lac; his best friend and love of his life, Joan Tillou of Horicon, along with five grandchildren and one more due in October; cousins, other close relatives, lifelong friends and his beloved cat, Socks. Jeff is preceded in death by his parents, Robert and Helen, his brother Jamie, his son, Justin and cat, Snickers. The Kratz-Smedema Funeral Home in Fox Lake, WI is serving the family. For more info or to leave online condolences visit: www.kratzfh.com. To send flowers or a remembrance gift to the family of Jeffrey J Jenkins, please visit our Tribute Store. "Email Address" would like to share the life celebration of Jeffrey J Jenkins. Click on the "link" to go to share a favorite memory or leave a condolence message for the family.